This section is from the book "The New Book Of Golf", by Horace G. Hutchinson. Also available from Amazon: The new book on golf. The open stance enables the player to gain great control over the club, and to follow through with very little effort. She is also better able to see where she is going, and so is enabled to take straighter aim. On the other hand, it undoubtedly encourages any tendency to swing too vertically. It also necessitates a more forcible turn of the body to get the proper position at the top of the swing. The third kind of stance is held to have the advantage of helping the player to take the club well out away from the body, and so encouraging a larger, flatter sweep of the club. But it must be admitted that this theory is not so popular as it formerly was. It is also true that this stance produces a tendency to stoop, from the endeavour to reach out over the left foot, and that it increases the difficulty of aiming straightly. If the player has no very decided preference, it will probably be better for her to adopt the square stance, but if she has any strong inclination towards either of the other two, there is no valid reason why she should not take her own way. If the open stance be adopted, care should be taken not to exaggerate it, as, even if by so doing extra length is obtained, certainty will be lost, and a tendency to slice will very probably be developed. With the square stance the ball usually lies about halfway between the feet, but the further forward it can be brought towards the left foot, with comfort, the better, as this mitigates the chances of the player getting her hands too far in front of the ball. With the third kind of stance the ball can be either in a central position or closer to the left foot. There is much to be learned from studying the styles of the prominent golfers of the day, an advantage from which those are not wholly debarred who have not the opportunity of seeing these players on the links. Characteristics of style may be noted from the photographs, of which such numbers are being constantly published; but for this purpose the photographs should be snapshots taken during actual play. Posed photographs are unsatisfactory, as they usually present the players in a somewhat constrained and unnatural attitude, and are not trustworthy representations of their style. The following notes are drawn from memory, supplemented by a collection of photographs. Miss G. Ravenscroft, the Champion of 1912, has rather an original style. Her driving swing is upright, and although she hits hard there is no appearance of forcing. Her iron shots are played in the push fashion, that is with no follow-through. The club head seems to dig into the ground, and the ball flies away low and straight. Her putting style is quite unique. She walks up to her ball and plants her right foot down beside it, almost as if she had measured a specified distance with her eye, the left foot is then swung round in a half-circle, and the ball is played from abreast her right heel. The right knee is kept bent and turned inwards. The club is held fairly low down the leather. 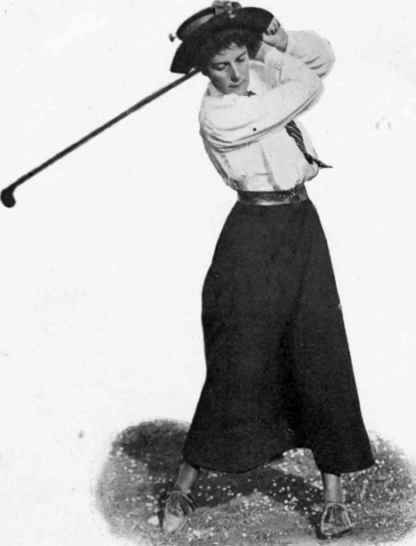 Miss Dorothy Campbell, the Open Champion of 1911, has a short, rather straight up and down swing. She stands fairly square, with the ball nearer her right foot than her left. She has a very steady stance, and is one of the very few players who do not turn on their right toe in following through. In her follow-through her arms go straight out and her right elbow is very little bent. She does not appear to put very much force into her balls, but her timing is very accurate, and her wrists come greatly into play at the moment when she is hitting the ball. 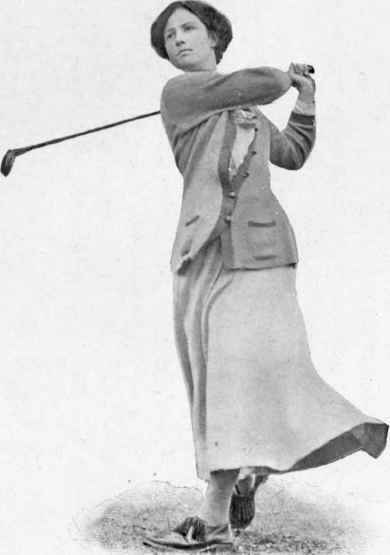 Miss Violet Hezlet, silver medallist in the 1911 open championship, has a flatter swing than Miss Campbell. She has shortened it very much of late years, but to compensate for this she has a very full follow-through, so full, in fact, that in one of the photographs she appears to be poised on the tip of her right toe and the heel of her left foot. Miss E. Grant-Suttie, the Scottish champion of 1911, is very typical of the North Berwick school. She has a short swing, and in taking back her club her left arm is almost straight and her right elbow very much bent, while the nose of her club points to the ground in the fashion upon which Mr. Darwin lays so much stress. Her follow-through is restrained - her arms go straight out and they are very little bent. 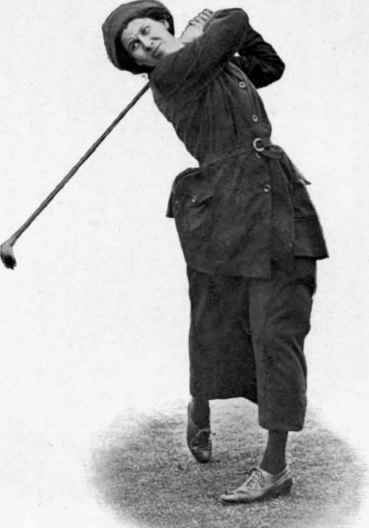 Miss Mabel Harrison, the Irish champion of the same year, has a very full swing and a full follow-through down the back of her neck. She uses the open stance with her feet rather close together, and plays off her right foot. 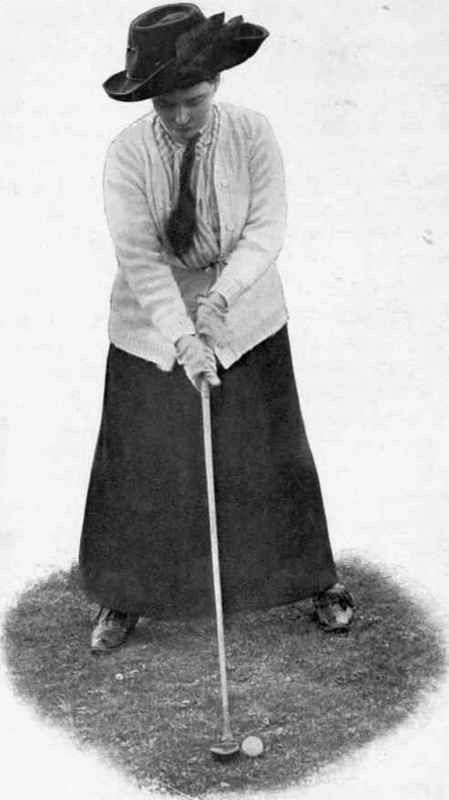 Miss Cecil Leitch possesses a flat swing, that is to say, she takes the club back round her shoulder rather than round her neck. Her follow-through is full, the club going right back over her shoulder, with the nose pointing to the ground, but she keeps her hands low and her right elbow is very little bent. Her body is turned considerably round from above the waist, and she rises on her right toe while the left foot is firmly rooted to the ground. Miss Leitch has a singularly loose free style. Miss Doris Chambers has only a three-quarter swing, but a very full follow-through. She plays with rather short clubs. It may be worth while to see what deductions we can make from the styles of these few among the many leading players, as we have described them. Of the seven players referred to four are average long drivers, three are exceptionally long drivers. Miss Dorothy Campbell and Miss Grant-Suttie, who may be classed among the average drivers, are renowned for their steadiness. Miss Cecil Leitch, Miss Ravens-croft, and Miss Doris Chambers rank as exceptionally long hitters, but they are at times very erratic. Miss Campbell and Miss Grant-Suttie both possess somewhat restrained swings, while the other three are exponents of a very loose style. Miss Campbell, Miss Harrison, and Miss Grant-Suttie are of average physique. Miss Violet Hezlet is very slightly built. Miss Leitch, Miss Ravenscroft, and Miss Chambers are all of powerful physique. Now, five of these players follow through very fully. 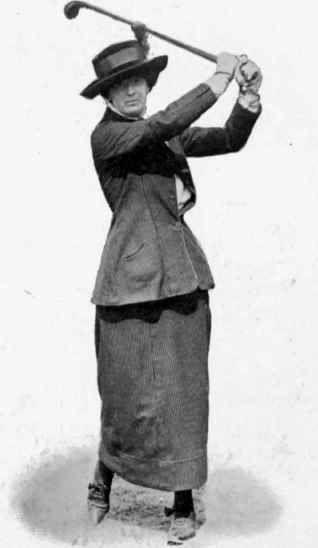 Miss Grant-Suttie and Miss Dorothy Campbell do not follow through quite so fully, still they do so sufficiently to uphold the rule that a good follow-through is essential to good golf. The three most powerful drivers of the seven are Miss Chambers, Miss Leitch, and Miss Ravenscroft; therefore we make the deduction that the looser the swing and the more strength there is behind it, the greater the distance the ball can be driven. But when we come to a comparison of the steadiness of the seven players, we have to admit that in this Miss Campbell and Miss Grant-Suttie easily head the list. Therefore it seems evident that abnormal length and steadiness do not, as a rule, go together. One must be sacrificed to the other. The short swing is easier to control and guide; the very free swing has a tendency to get, as it were, out of hand. The effects of a slight fault are more likely to be accentuated in a very loose swing, and that is why, with a player of this class, when things do go wrong they go very wrong indeed. Now there cannot be two opinions as to which is the more valuable quality for winning matches, steadiness or extreme length. It is not the slightest use to make prodigious drives at twelve holes out of eighteen and miss the remaining six. Of course I do not mean to imply that length is of no importance. A certain measure of length is absolutely necessary for any one who wants to gain high honours. But my point is that the straining after length to the sacrifice of everything else is a mistake, and that the violent effort to swing to the utmost possible stretch backwards and forwards, in the hope of gaining every possible extra inch, is not worth while. It only leads to disappointment and disaster. There are times when the golfer can take liberties with her swing and put more into it than at other times. 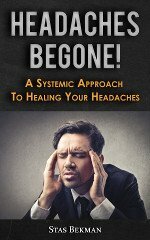 When she is in thoroughly good practice and playing up to the top of her game, she can let herself go in a way which would be absolutely fatal on ordinary occasions. But it is rarely that these happy moments come, and the player must be very sure of herself before she counts upon them. She may bear in mind, as a warning, the fate of the fair lady who wanted so much to win the driving competition at one of the open championship meetings, that she swung with such tremendous energy and abandon that after hitting the ball she completely overbalanced and fell flat on the tee.